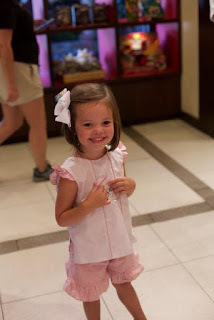 This post is the last post in the series from the Disney trip we took in September. You can read about our time at Animal Kingdom here, Hollywood Studios here, and the Magic Kingdom here. Details about how I planned our family vacation are here, and what I packed/how we traveled with two young kids are here. Thank you for following along with my family's journey to Disney! I hope you have gained some insight that helps when planning your own trip - or that you just enjoyed reading about our adventures! I really can't wait to go again! I took a lot of advice from family and friends when planning our trip to Disney. However, one piece of advice that I received (several times, in fact) I ignored: that was to not go to Epcot because our kids were so young (2 and 4). I chose to ignore this advice because I remember loving Epcot as a child, and couldn't stand the idea of not going. And boy am I glad we did!!! I only made two FastPass+ Reservations for our day at Epcot: Spaceship Earth, and Frozen Ever After. We chose to start the day with Spaceship Earth - it's an "oldie but a goodie" that everyone enjoyed. We headed next to The Seas with Nemo & Friends Pavilion. Next to 'Elles', fish are Baby Sage's favorite animal, with him loving Nemo in particular, so you can imagine how much fun this was for him! Actually, both of my kids really enjoyed this, and we could have literally spent hours there! The adventure starts by boarding a "clamobile" and searching for Nemo - it was just sweet and precious. We then saw the aquarium, which was real-life characters from the film. One tank was full of Clownfish - which of course, is what Nemo would be. There was another tank that had various characters from the film, where we spotted, Dory, Nemo, and Marlin. From there, we saw the 5.7 million gallon tank! (Yes, you read that right and yes, that IS a lot of water!!!!) This housed sharks, stingrays, sea turtles - and a lot of other small fish. We loved watching a diver feeding the stingrays - it was amazing! Of course, in typical Disney fashion, you have to exit through a gift shop! 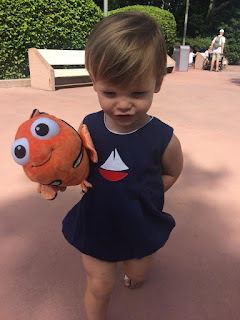 I think Sage and I were already outside when we realized the grandmothers and grandkids were still inside... Baby Sage walked away with a Nemo stuffed animal, and Emma decided to pick something out in "Norway" (from the Frozen exhibit). Yes, it's true: my kids came home from a LOT of stuffed animals, but I will say, they are still sleeping with them all each night! 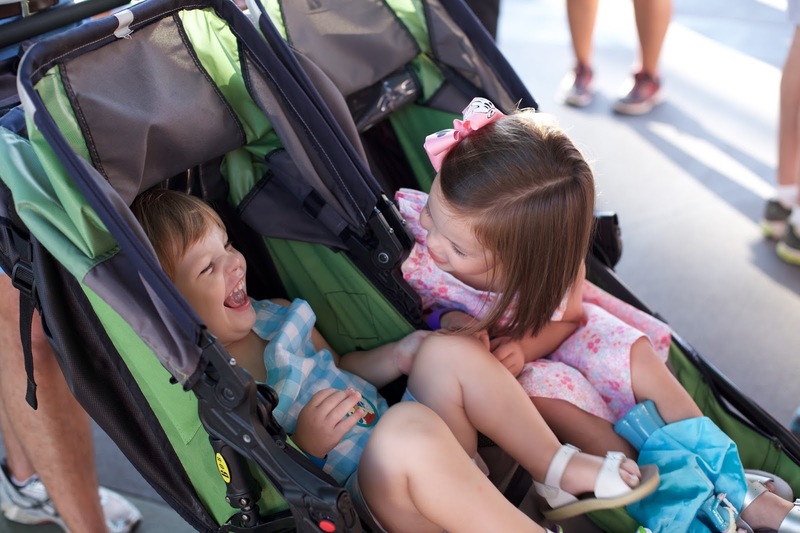 Once we put Baby Sage (and Nemo) in the stroller to head to the World Showcase, he was asleep immediately. Our first stop was Norway to meet Anna & Elsa in their summer home. Emma will tell you this was her favorite part of the entire trip - yes, even better than getting her hair done the first night. She truly was in little girl heaven. We stood in line roughly half an hour here, but the line moved quickly, and we stayed entertained weaving through their home. Not bad at all! We met Anna first, and she was extremely friendly and really took her time with Emma. She asked Emma if she liked to build snowmen and Emma responded that it doesn't snow in Alabama! While all of us were laughing, Anna quickly invited Emma to Arendelle to build one. Emma gave her the sweetest hug before we moved on to meet Elsa. 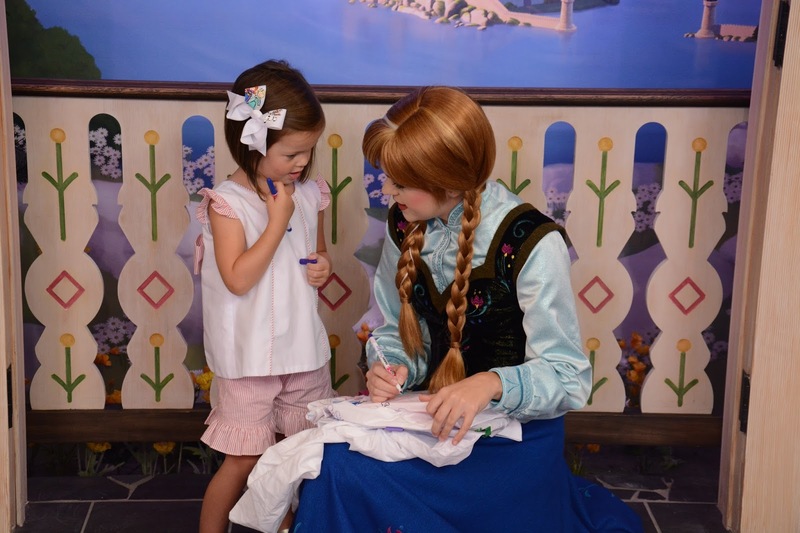 I have to say, while Elsa was just as sweet to Emma as Anna had been, I truly think that Anna is Emma's favorite of the two (in the movie and in 'real life'). I'm so glad we did this at the end of the trip, because I'm afraid that it might have ruined the rest of it for Emma if we had done it sooner! Before we could leave Mexico we had to take a quick (it's actually a slow) boat ride through Mexico! We boarded the small boats for the Gran Fiesta Tour, starring The Three Caballeros. Once done with that, we left Mexico to walk slowly through the World Showcase. Germany had this big miniature train set that Baby Sage just LOVED! Emma was actually pretty excited about it, too! Both kids hopped out of the stroller to watch/run after the trains. The best part was when the train went under the walkway and came out of the other side. We literally had to pry Baby Sage off the metal railing he was having so much fun. 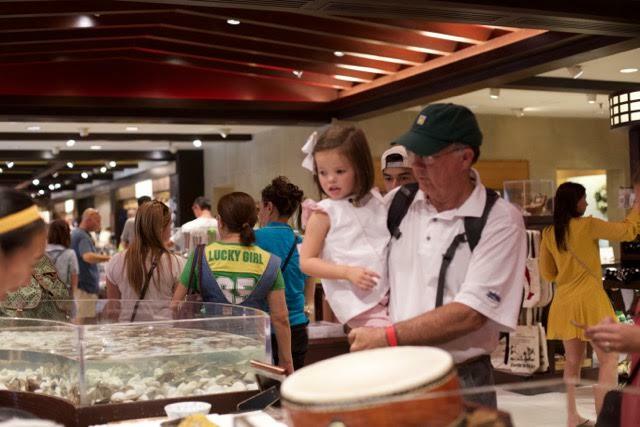 We continued to walk through the different countries, but stopped at Japan for the Pick-A-Pearl station located inside the Mitsukoshi store. I remembered doing this as a little girl, and was excited it was Emma's turn! First you go to the register near the oyster tank, pay for your oyster selection, and then wait for your number to be called. When Emma's number was called she was asked to pick an oyster out of the tank. We had a very enthusiastic cast member who, prior to opening Emma's oyster taught us how to count to three in Japanese. As we all counted to three, she began banging a drum. When she opened Emma's oyster, there wasn't just one pearl, but two! Emma called them twins! They were a beautiful silver color that the cast member cleaned up and even measured for us. Emma was so proud of her pearls, and G-Daddy was pretty proud of Emma's luck. In fact, he wanted to buy more oysters to go with her luck. We told him that we think since he paid for the oyster, it's only fitting he pay to have them set at Jimmy Smith Jewelers. He didn't laugh at that quite as hard as the rest of the adults did for some reason... Either way, when Emma gets her ears pierced, you know what her first pair of earrings will be! We continued through the World Showcase and then headed back to the hotel around 2:30 to rest a bit and freshen up for dinner that night. 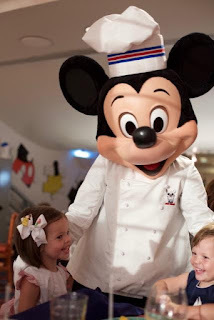 We had dinner reservation at Chef Mickey's inside the Contemporary hotel. I wanted to end our trip with a bang and what better way than with Mickey and his crew dressed in chef's attire??? At dinner, we got to meet Mickey Mouse, Minnie Mouse, Donald Duck, Goofy, and Pluto. Dinner included lots of dancing, and swinging napkins over our heads! You know, all the things we teach our kids they are not allowed to do at the dinner table! Don't worry: to loosen us up, adults have the opportunity to enjoy some cocktails with dinner - it helped with the rule breaking. The cocktails were great: the buffet, not so much. But we were there for the characters and the fun right?!?! I will say the dessert buffet was delicious, and that, among all of us, we probably tried every single dessert! After dinner, we headed back to the Magic Kingdom. We had purchased the Park Hopper prior to our trip. Without the Park Hopper you are limited to one park a day (the park you start in). With it, you can obviously switch between parks. We thought we would use this a lot, as I originally believed we would probably end each day back at the Magic Kingdom, but we were truly too exhausted each day to even consider it. With the age of our kids, we did not need the Park Hopper. If you have older kids, it might be worth it, but it definitely wasn't needed for us. So why, on our last night there, did we go back to the Magic Kingdom? 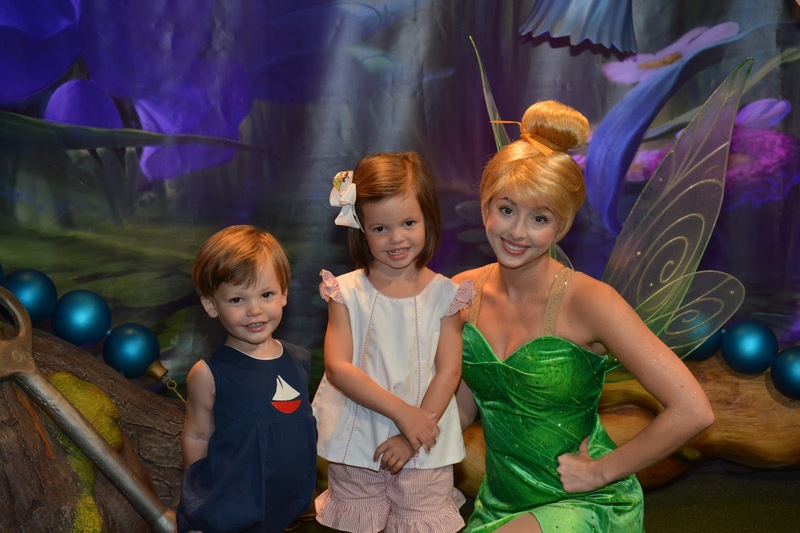 We had not seen Wishes yet, and the only thing Emma said she hadn't gotten to do was meet Tinkerbelle. So you can guess where we headed when we arrived! Luckily, the line for Tinkerbelle was only 10 minutes. We got a great surprise with Tinkerbelle! While we went for Emma, I actually think Baby Sage may have enjoyed it the most. The whole trip, he wasn't exactly scared of the characters, but he also didn't really want to interact with them. That all changed when he met Tink. He was absolutely smitten with her! Both he and Emma gave her lots of hugs and also got her autograph. Baby Sage had a smile on his face the entire time! I was so glad we had gone back for that. And, of course, we exited into a gift shop! In the end, it was a good thing, because we hadn't purchased any Mickey Ears, and what is a trip to Disney without Mickey Ears??? It has been a little late in the trip, but oh well! They made good use out of them for Halloween! We then took a spot on Main Street for Celebration the Castle Light Show. I won't lie. I was skeptical about how great this would really be, but I was amazed! It really did wow me. (And everyone else.) After the light show, it was time for the Wishes Firework Show - which is, naturally when Baby Sage decided to fall asleep on me! This child can obviously sleep anywhere and through anything, because those fireworks are LOUD! It was an amazing firework show, and we all loved seeing the beautiful castle lit up. Emma especially enjoyed seeing Tinkerbelle fly - especially since she had just met her! I hate that Baby Sage missed it, but maybe he'll be able to stay awake for it on our next trip! I was so happy with how it all ended. It was a really fabulous five days with family! I am so glad Sage agree to take us, thankful for the helpful (and generous!) grandparents who went along for the ride, and for sweet children that had the time of their lives! I'm ready to do it all again. Well, maybe in a year. It takes some time to plan, you know. This post is a continuation of our series from the Disney trip we took in September. It is the 5th post in the series. 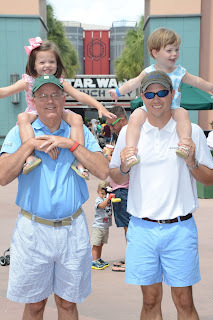 You can read about our time at Hollywood Studios here and the Magic Kingdom here, how I planned our family vacation here, and what I packed/how we traveled with two young kids here. My last post will be about our time at Epcot. On our fourth day in Orlando, we headed to the Animal Kingdom. I had made FastPass+ reservations for the Kilimanjaro Safari, Festival of the Lion King, and Expedition Everest, but we actually started at the Tree of Life to see It's Tough to be a Bug. You were suppose to wear 3D glasses while watching it, but neither of my kids was too keen on that. I will say - it was a great show! You get sprayed by a stink bug, stung by a bee, and sneezed on by another bug (I don't remember what it was called). To me, the best part happened at the very end: they ask that all of the bugs exit the theatre first, and you can feel them underneath your bottom!!! All of the adults really enjoyed this and laughed, but my little princess was not a fan at all. In fact, I think Emma would have preferred to skip all of It's Tough to be a Bug. We left there to use our first FastPass+ on the Kilimanjaro Safari. Let me just say - my kids LOVED seeing all the animals!!! I actually think this may have been one of the highlights of the entire trip for Baby Sage. He loves elephants (which he calls Elle) - in fact, his love kind of borders on obsession. (Sage and I are a little concerned all the money we have been saving for college may end up going to Alabama instead of Auburn he loves elephants so much... but I digress.) You can imagine his excitement when he got to see the "Elles" - he was just in his element! Disney is smart about their planning: you exit the safari right into an outdoor gift shop. Of course, Sage and I immediately took the kids in the direction of the Gorilla Falls Exploration Trail, attempting to bypass the gift shop. Well, we might have, but the grandmothers apparently spotted some stuffed animals they were sure the kids needed! While on the trail, we saw gorillas, meerkats, birds, and a hippopotamus! Actually, we saw a lot more than those four creatures, but those are the ones that stick out in my mind the most. Again, my kids were in heaven. They really enjoyed this portion of the Animal Kingdom. Once we finished the end of the trail, we headed out to brunch. We had a dining reservation at 10:30 at the Tusker House. We purposely chose that last breakfast reservation there for a few reasons. While we were eating this as our lunch meal, we thought breakfast food might be a better choice for my two kids as lunch was "African cuisine." Also, I'd been told their breakfast buffet was fabulous, and I didn't want to miss that! It was the right call for our family because the food was great, the kids ate well, and they got to see a bunch of their favorite characters! Mickey, Goofy, Donald Duck, and Daisy all came around to meet us. Baby Sage had started warming up to the characters, and he loved interacting with them from his high chair. He also got his picture taken with them (still from his high chair, but baby steps!). The grandmothers decided after lunch was the perfect time to mention what all they thought the kids might need from that outdoor gift shop. Once in there, Baby Sage immediately ran towards an Elle, and Emma chose a Cheetah. What can I say? We left with happy kids and happy grandmothers. Once everyone was please with their gift shop purchases, we made our way to the Festival of the Lion King. I must say, this is a MUST DO for any family! It was an amazing 30 minutes packed full of swinging, dancing, acrobatics, and some good old fashioned fire throwing! The kids loved every minute, but the adults also enjoyed it as well. A win win! Oh yea, and we could also hear the screams as we stood near the entrance of the ride and we saw it fly by. No big deal. Daddy and G Daddy actually really enjoyed the ride, and insisted that AA and Momma G do it, too. And since I wasn't riding and neither was Emma, they opted to go use our passes and go with them again. 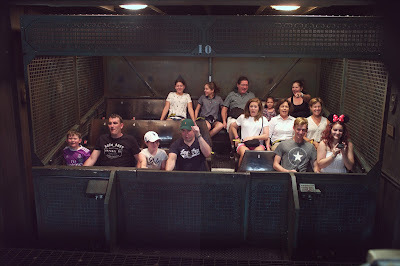 I had to laugh as they all exited the ride - it was very obvious that three out of the four were not feeling so hot... I'll let you guess which three! We let them rest to collect their thoughts and bodies when they were done, as they were all a touch rattled. Once they were all recuperated, it was off to the TriceraTop Spin! Emma was actually the only one who rode that, as sweet Baby Sage fell asleep the moment he sat down in the stroller after Festival of the Lion King, and had been sleeping the entire time. We decided it might be a good idea for all of us to go back to the hotel and get some rest - but not before we each grabbed a Mickey Ice Cream Bar! As luck would have it, Baby Sage chose that time to wake up, which is good, because he loves ice cream! He would have been super upset to miss out on that treat. We opted to spend the rest of the evening in the hotel. The adults had cocktails around the pool while the kids swam, and then we all ate dinner together before opting for early bedtimes. We were all exhausted and wanted to make sure we were ready for our last day at Disney. This is post 4 in the series of my family's trip to Disney. I encourage you to read all of the posts as they each cover a very different aspect of the trip! I outline the planning process here, packing for/and traveling with toddlers here, and our first day and a half at Magic Kingdom here. After a very magical day and a half at Magic Kingdom, we headed to Hollywood Studios the next morning! We actually arrived just a few minutes before the park opened, which was a fun experience. I had pre-booed us three FastPass+ reservations (Toy Story Midway Mania, Frozen Sing-Along, and Tower of Terror). We had been told repeatedly we would want to ride Toy Story Midway Mania twice because it was so much fun, so we decided to make use of our first FastPass+ there. It was the first place we headed. As did EVERYONE else once the park doors opened. It was like a scene from a movie, with people running from all directions, yanking kids out of strollers all while running/pushing the stroller - it was a mad dash. Everyone in our group kept laughing at the mayhem as we tried to pick our jaws up off the ground. Both kids ended up really enjoying it, so we did ride that one twice that day. 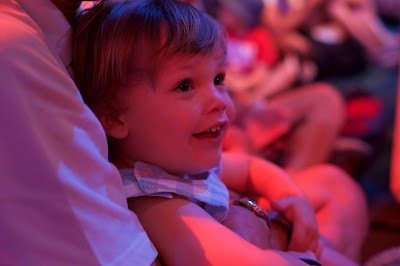 Before lunch we saw Disney Junior Live on Stage and rode The Great Movie Ride. 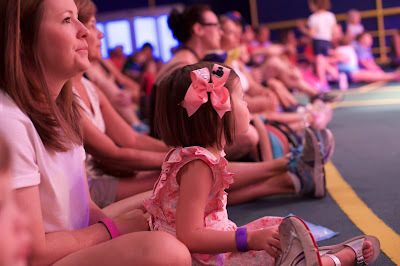 We actually had a really awesome experience at Disney Junior Live on Stage that we weren't expecting. Since we were first in line, they dubbed us the "First Family," which gave us the ability to use the "secret word" to open the doors (and go in first, of course). In addition, we received a "First Family" certificate with had been signed by some characters. It was just a super fun surprise we weren't expecting! If this is something you think your kids would really enjoy, it might be worth it to do this first when you go! Oh yea, the secret word was really more of a "secret phrase": Meeska Mooska Mickey Mouse! Lunch that day was scheduled at Hollywood & Vine. It was buffet food, and definitely wouldn't go down as our favorite of the trip. 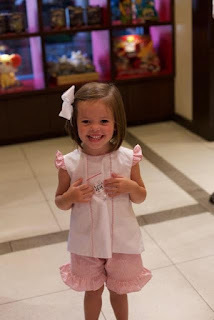 However, we were able to meet Doc McStuffins, Jake, Princess Sofia, and Handy Manny, so that made it all worth it! (At least to Emma it did - ha!) Emma really had a hard time sitting still and eating lunch because she was so excited to see all the Disney Jr. characters. We put Baby Sage in the stroller and he was once again out as we left lunch. He really napped so good the entire time in the stroller. I even considered trying to bring one of those strollers home with us! Because he was sleeping, Baby Sage completely missed out on Voyage of the Little Mermaid, but he did wake up to enjoy the Frozen Sing Along. While we did take two small children, don't think there was no fun for all of the adults involved! 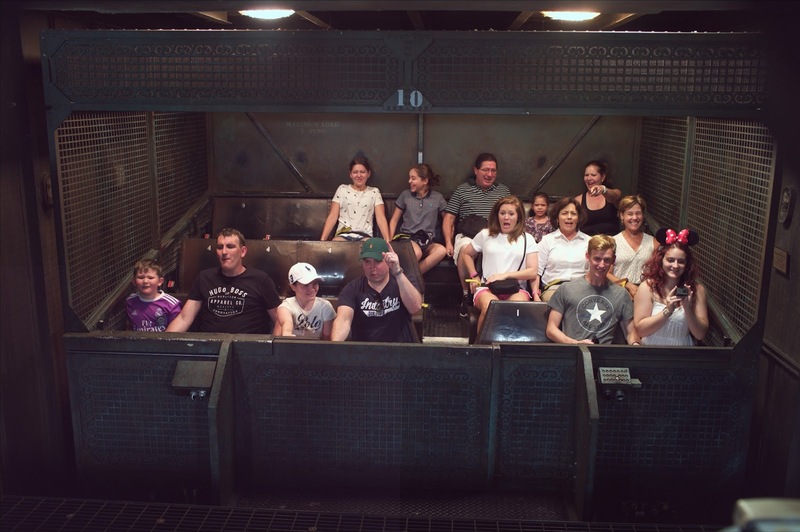 One thing I did just for the adults was book us on the Tower of Terror. We just left the kids sitting in the stroller and went on our merry way! Just kidding - we did it the junior high way of Girls, then Boys. Based on the photos we got, it would seem that I was a teeny, tiny bit terrified - and I wanted to be 100% sure my seatbelt was fastened... I guess it is safe to say the ride is aptly named! About 'Ohana - it is a must-do!!!! It was a Hawaiian-style feast, and just simply fabulous. Everyone loved it - the men included! Our waitress just constantly continued to bring around chicken, steak and shrimp, until we were all so stuffed we wondered if someone could push us back to our rooms! Unfortunately for Baby Sage, he had fallen asleep again on the way to dinner, and slept through the entire feast. The hostess was super sweet and let us just push the stroller up to the table. I guess all the fun of the two days before had gotten to him, and he pretty much slept that entire afternoon out of pure exhaustion. After dinner, we headed back to get some sleep for everyone before we headed to the Animal Kingdom the next morning.